When the Co-operative challenged me to make an Easter centerpiece I had a think about what Easter meant. To me it is a time to be spent with family and signals new beginnings. A Spring style dessert would be fresh and exciting. To my children Easter is all about the chocolate eggs. 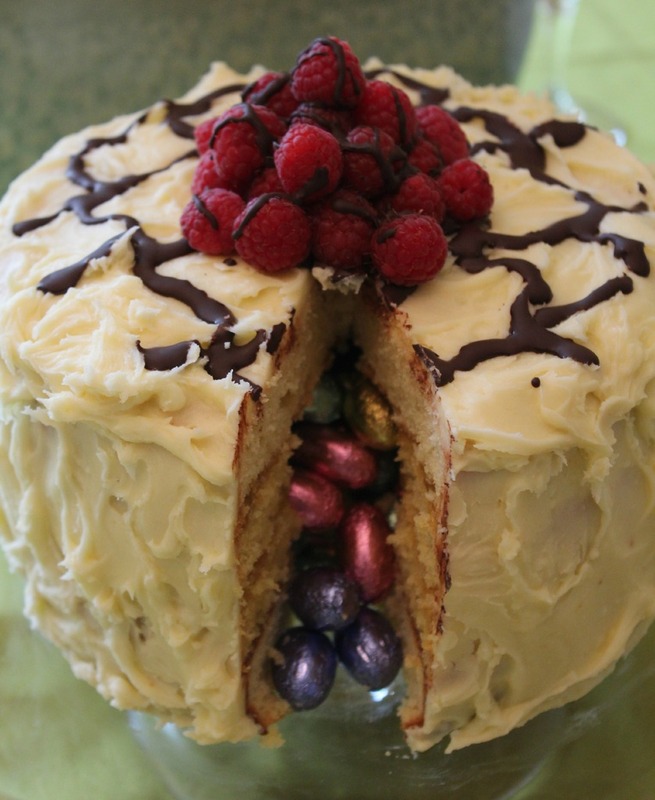 I therefore decided I would try and combine the two with this more adult looking cake from the outside but with a surprise chocolate egg middle. You will need to start by making four 8 inch round sponge cakes. Mix the eggs, caster sugar, and flour together with the butter. I find it easier to melt the butter. Divide the mixture into four and bake at 180C for approximately 15 minutes. Once cooled you will need to cut holes in three of the sponge cakes. Place the three layers on top of each other with a generous layer of lemon curd sandwiching them together. 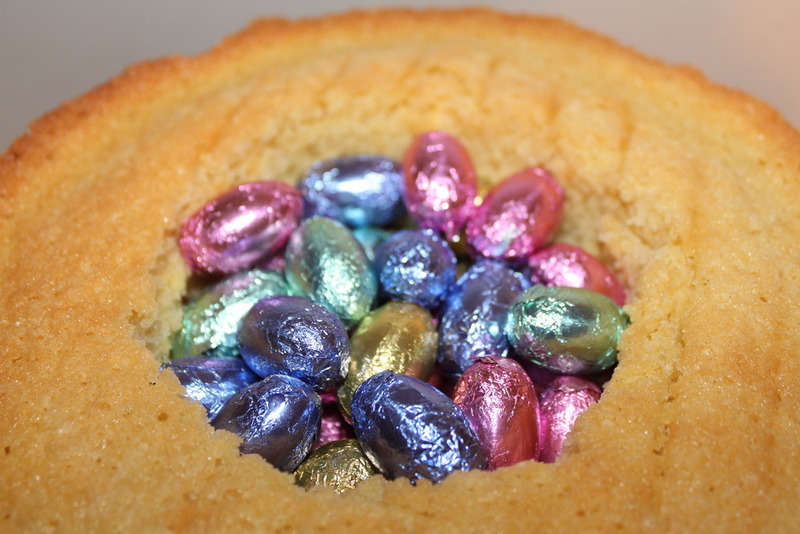 Fill the hole with foiled Easter eggs before placing the last cake layer on top. To make the frosting you need to cream the butter and icing sugar together. Next heat the white chocolate in the microwave at 400W for 2 minutes. Take out, stir and repeat for 20s intervals if necessary. Mix the white chocolate into the butter icing. Using a blunt knife spread the butter cream all over the cake. Next I melted half a bar of Co-operative fairtrade dark chocolate and poured it into an icing bag. I cut a small whole at the end and piped the chocolate on the top. Lastly I added the raspberries with some more drizzled chocolate. Will you be making an Easter centrepiece dessert? If you are looking for some baking inspiration then take a look at the recipes on the Co-operative site. I was provided the ingredients for this post by the Co-operative Food. What a fabulous cake - it looks brilliant! this looks really yummy. it wouldn't last very long in my house. OMG This is a masterpiece! Well done and thank you for sharing! Might have an attempt at making one too! That's a fabulous idea for a cake, but i would prefer unwrapped chocolates in it. It didn't last long here! That looks, and sounds amazing! The perfect Easter dessert. Awww thanks - I need to learn to cook some healthy foods! 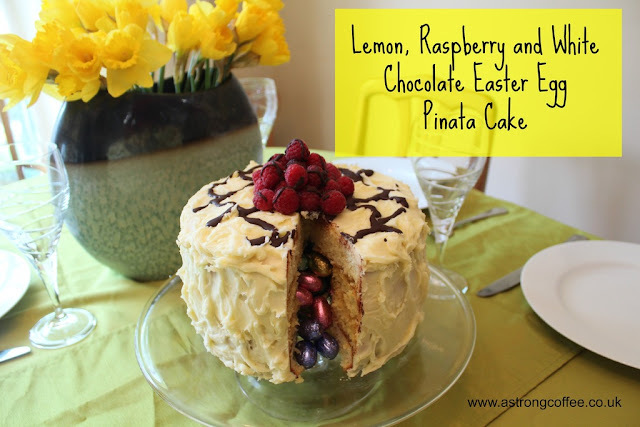 What a fantastic looking cake and great surprise for Easter with the chocolate eggs inside. Love this! I always imagine that I could do something like this, reality is, I know I would totally stuff it up! Lol Ill keep dreaming that I can do this! This looks amazing - well done! A brilliant idea, it looks absolutely amazing! AceJob, I have to try this! the word YUM comes to mind! Bookmarking this for next year! How fabulous, Lydia's birthday soon, so I think I'll try something similar, doesn't have to be Easter egg, so will have to get my thinking cap on! Thank you so much or this, great great idea! A clever idea beautifully executed. That is one luscious looking cake! Wow lush! I might try this one day! That looks amazing! Fab job!